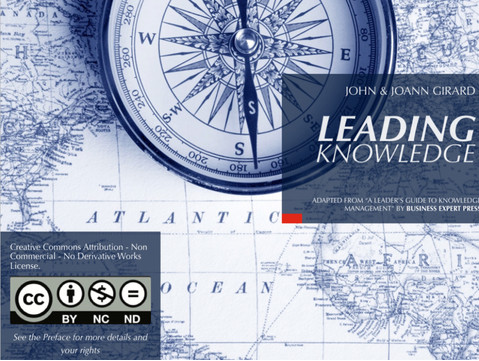 Leading Knowledge 2.0 – John Girard, Ph.D.
We expect Leading Knowledge 2.0 to be published in 2015. In the meantime please feel free to download Leading Knowledge, which is now available free of charge from the iTunes store. This book can only be viewed using iBooks (iPad and Mac users). Leading Knowledge is the iBook adaptation of A Leader’s Guide to Knowledge Management: Drawing on the Past to Enhance Future Performance, published by Business Expert Press. Leading Knowledge builds on the many great works in the knowledge management domain; however, it is unique in that we focus on what we should be doing now (or soon) to ensure the next generation of organizational leaders knows what we knew. In other words, are we creating organizational memories today that will be useful to the leaders who follow us?